An unpaid advertisement for the only usable browser that still exists. Welcome to the personal website of Andrew Turnbull. This outpost features tons of stupefying and trivial things pertaining to various and diverse interests of mine. Chances are, if there's something I know about or like that doesn't much other representation on the 'net...there's a bit of it here. The front page updates every week. And it is just a static page. 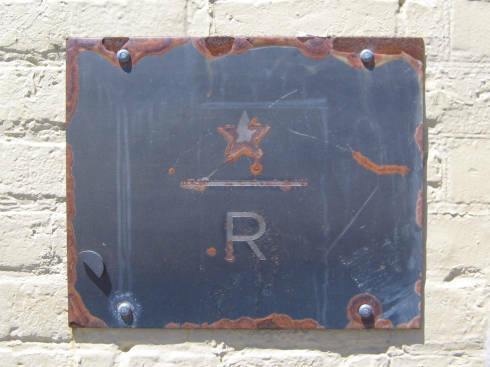 This mysterious sign, emblazoned only with the letter "R" and a five-pointed star, faces the sidewalk on a building wall in the 600 block of Richmond in London, Ontario. My best guess is that this is a cryptic message for firefighters or emergency workers: "Fire exit rear," maybe. Or perhaps "R" means "roof truss contruction." But I don't know. If this were an emergency code, I'd expect that A) it would be documented somewhere on the Internet, and B) I'd have noticed similar signs on other buildings as well. So far, neither of those points have held true. Any guesses? Let me know. This is a symptom of the reason why I'm not a Christian, and will never be a Christian again. 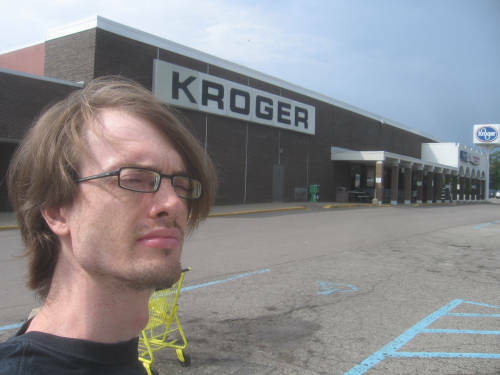 The supermarket sagas return this week with a truckload of new content covering one of the biggest chains south of the border: The Artifacts of Kroger. This is by far the largest, most ambitious, and most meticulously researched section I've written so far, and I've divided it into three pages. And that's not all. 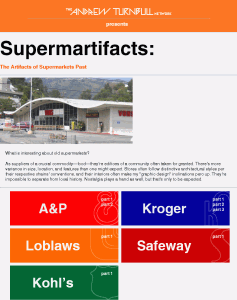 I've given the supermarket pages a nice little portal for clicking between them: Supermartifacts. Kind of catchy, don't you think? 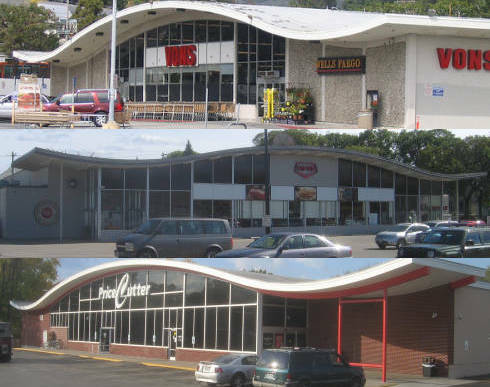 With the four biggest pieces of the puzzle filled (and with library school ramping up), The Artifacts of Supermarkets Past will be taking a break from here on out. This week, The Artifacts of Supermarkets Past moves north of the border to take a look at Canada's biggest grocer: Loblaws...as well as National, its oft-forgotten U.S. subsidiary. Ever since 2017 when I moved there for graduate school, "Canada" to me has meant "London, Ontario." 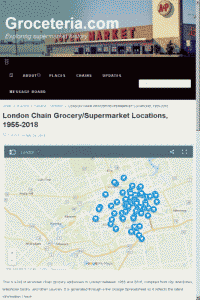 London also has an abundance of older grocery stores that opened as Loblaws stores, continue to operate as grocery stores, and even continue to sell Loblaws products...but which aren't branded as Loblaws stores any more. These mysteries and more are what get deciphered on this page. 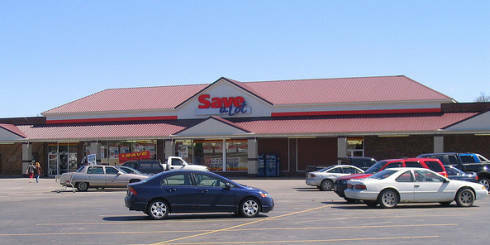 The supermarket sagas continue this week with a new content addition: The Artifacts of Safeway! This is one area in whch the notion of "detached fascination" applies: I've never shopped at Safeway, and I've never even lived in Safeway's historical trade area. 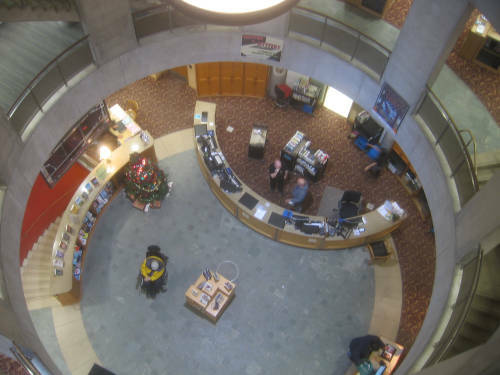 But, it is no matter: It's difficult to deny the aesthetic merit of these buildings. One of these pictures was taken in the place I started out in: Princeton, West Virginia. 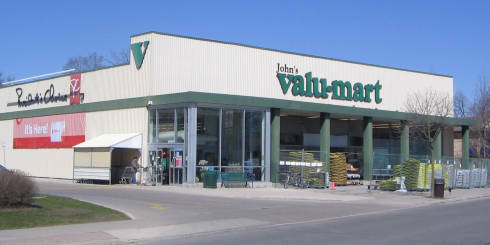 One of these pictures was taken in the place I ended up in: London, Ontario. Yet if these near-identical buildings are any indication, I am not the only thing that these two wildly-dissimilar cities have in common. 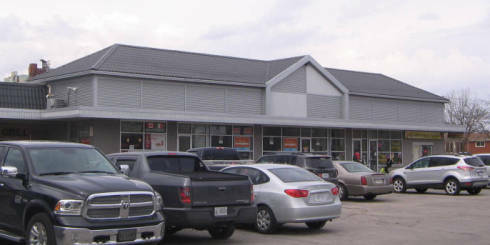 Both of these buildings housed A&P supermarkets through the course of the 1970s. And they're not the only ones: Hundreds of buildings like these exist, housing everything from churches to post offices to pizza parlours. 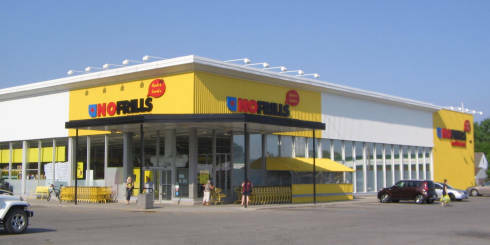 Some of them even still house supermarkets...but don't expect any of them to carry the A&P name. The company shut down for good in 2015. This weekend, I was inspired to dig through my photos to create a new gallery for the website: The Artifacts of A&P. Enjoy. 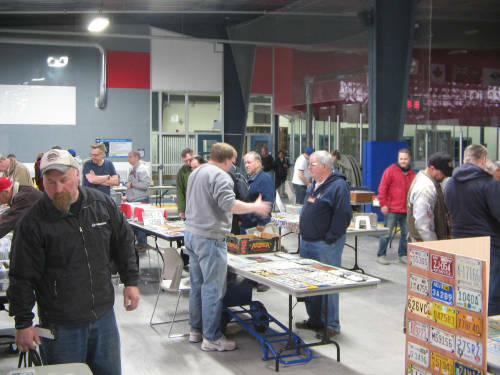 During my latter days of living in Wisconsin, I largely got out of the habit of going to plate meets due to disenchantment and disgust with my surroundings. Living in Ontario has been like turning over a new leaf, and it's rejuvenated my interest in things I'd given up on before. Where was I going? Acton. Therein lies the rub: Like Grimsby, Acton is an overbearingly white, conservative town on the fringes of the Golden Horseshoe. It's also a stone's throw from Georgetown, the community where the high school team was called "the Rebels" and embraced the Confederate flag as a symbol in my lifetime. 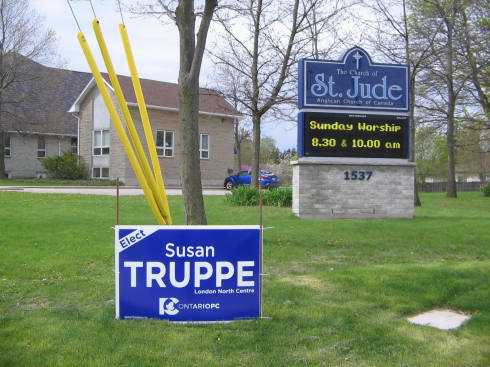 In case you wonder how American-style bigots and bullies like Doug Ford and Stephen Harper earn support, it comes in places like this. In spite of those misgivings, this meet was less melodramatic than the last. The drive there was under dry and daylit skies, I never got lost, and I had some idea of what to expect this time around. 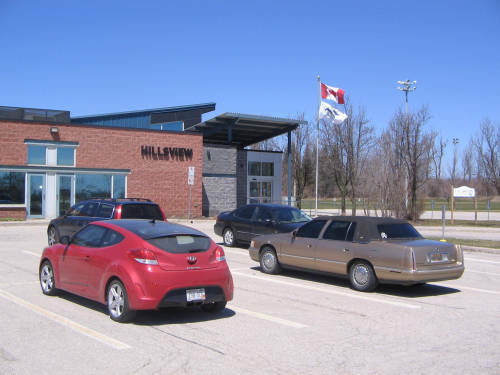 I lugged Birthyear Motorcycles Below the 49th from the car and walked through the automatic doors of the hockey rink serving as our venue. What would I discover this day? What I discovered was a crowd bigger than the one I had seen the previous October in Grimsby, albeit an overwhelmingly male one. I found a table and spread my mostly-unsalable US trading stock far and wide. The collector I had an altercation with last time was there, along with a collector whose collection amounts to a fetishization of police, so I felt on edge at times. But soon, I was digging through boxes and my inhibitions started to melt away. I found myself engrossed in conversation with David Wilson and Mike Franks over plates and topics as far-flung as new cars and foreign languages. Joe Sallmen had driven up from West Virginia (the state I once called home), and another collector had driven from Illinois and immediately recognized my name. Midway through the meet, two containers of complimentary coffee and Timbits arrived. 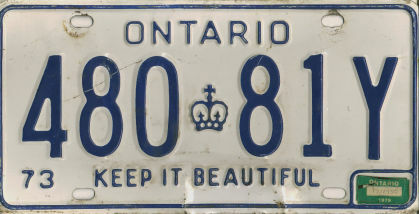 Every participant in the room congregated in a circular cluster for announcements, and a tale was promptly conveyed about a priceless Ontario temporary plate from 1916 that had been discovered and acquired in an auction. 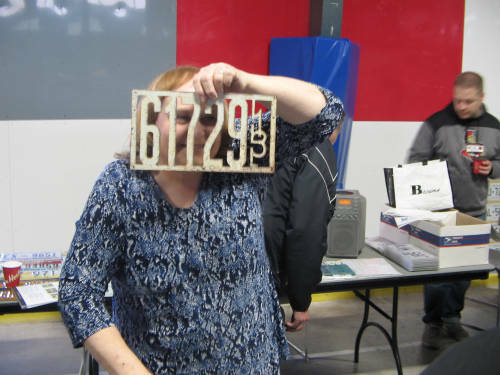 It was also time to show and tell about interesting plates, and this 1913 Illinois front plate with silhouette-cut numbers certainly fit the bill on that! I made the rounds of the tables and displays one more time for second pickings and photos. Then, it was over. Perhaps my collecting interests have become more world-aware as the US circles the drain. I found myself scutinizing international plates with newfound interest and enthusiasm, and came away with birthyear-appropriate plates from two of Europe's larger economies of the mid-1980s: France and Yugoslavia. 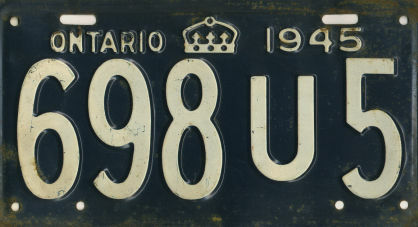 French plates used a delightfully straightforward coding and numbering system, with "69" indicating the department of Rhône, home to Lyon, the third-largest city in France. 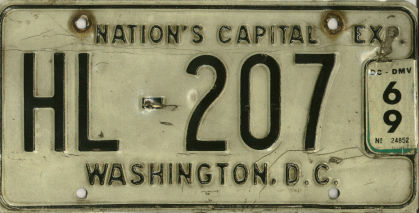 Yugoslav plates also carried a subdivisional code, and the letters "SA" indicated...Sarajevo. In 1985, Sarajevo was a thriving multicultural city in the Dinaric Alps that had just achieved recognition the world over for hosting the Winter Olympic Games. In 1985, the idea that the 39-year-old Socialist Federal Republic of Yugoslavia would cease to exist less than a decade later would have seemed preposterous. In 1985, it would have seemed preposterous that rural right-wing nationalists would join paramilitary groups to beseige a hitherto secular and liberal city, kill its residents, and reduce its cultural institutions to rubble. Alas, there are three things I've learned over the last four years in the United States: The circumstances of your life can change without warning. Trusted institutions can disappear in an instant, and the toxic mindsets that inspire war, death, fascism, and destruction are far more common than they ever deserve to be. 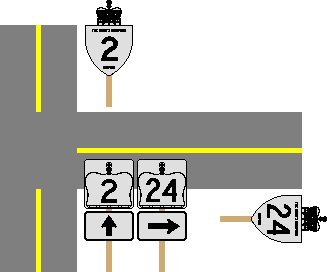 The Ontario Project has been updated after a winter hiatus, and the truck plate die survey has been updated and posted there as well. 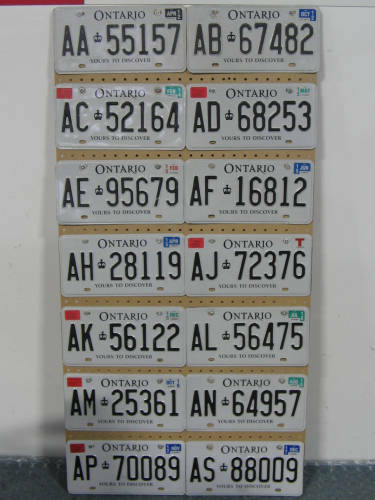 Remember the days of October, when I attended a license plate meet in southern Ontario? Well, last Sunday it happened again! 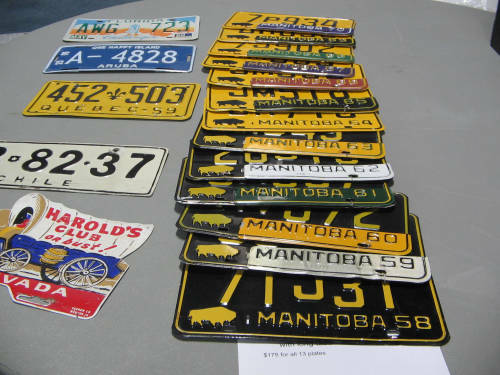 Jim Becksted enlivened the 16th annual Acton meet with a two-panel display of Ontario passenger, passenger-related, truck, and trailer plates. 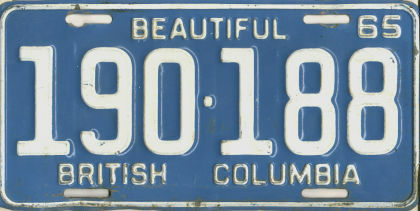 One plate was significant enough to overwhelm almost everything else on the board: CAN-001, the number traditionally issued to the prime minister of Canada. 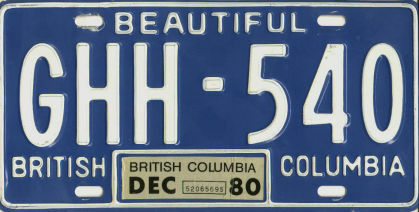 Duplicates exist; but judging by its used condition, I can only guess that this particular plate actually did once adorn Pierre Elliott Trudeau's limousine once upon a time. Mike Franks provided an array of the post-2011 commercial truck series in alphabetical order. It stops just short of the "AT" series, which was being issued at the time I moved to Ontario and which also happen to be my initials! 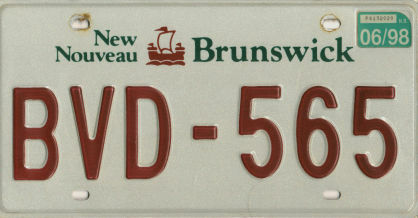 Both Ontario and Quebec issue distinctive plates to plug-in electric vehicles, but the Quebec version is notoriously tough to spot this far southwest of the Ottawa River. 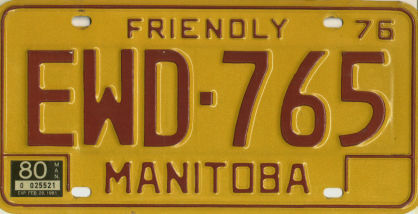 They're referred to as "green" license plates, and they bear a distinctive olive colour. Appropriately enough, their serials also bear the letters "VE"...a mnemonic for vert, or green! 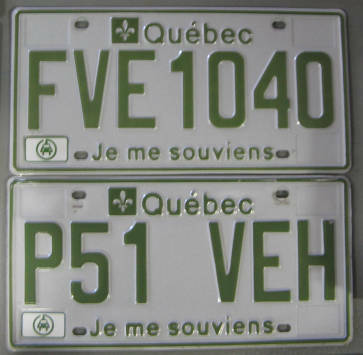 The seven-figure "FVE" plate was issued to a light commercial vehicle, while the lower plate was issued to a prosaic passenger car. 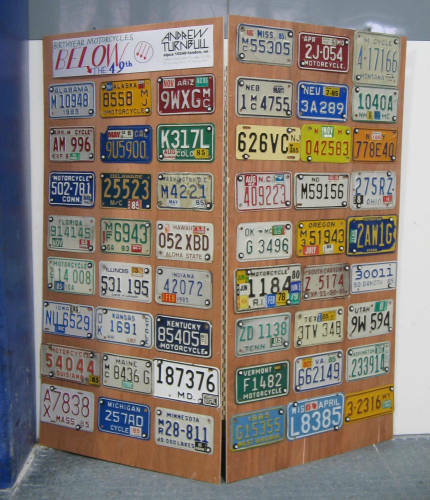 Twelve different versions of these plates exist for different vehicle types. Finally, there was the matter of my own display: Birthyear Motorcycles Below the 49th. It's a colourful, compact compilation of the 50 U.S. states and the notoriously-tough D.C., all in motorcycle form and all from 1985. I began working on this run in earnest at the 2014 ALPCA convention in Rochester, and had just recently located the last state I needed to finish it off: Louisiana. 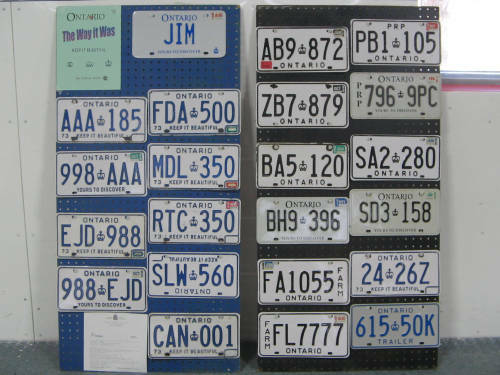 My Canadian birthyear motorcycle run will have to wait, though: Stickered plates from the Atlantic provinces and Northwest Territories are very difficult to find, so I'm only halfway there! This sign is a blast from the past. 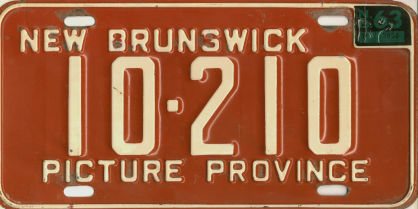 From 1917 to 1998, Ontario Highway 2 stretched the gamut of the province from Windsor to Cornwall, providing the main southwest-northeast conduit for traffic until the advent of the 401 in the 1960s. 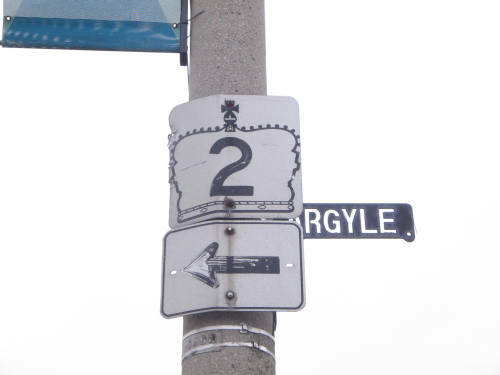 And it didn't stop there: At one time it connected to Quebec highway 2 and like-numbered thoroughfares in New Brunswick and Nova Scotia, forming a trunkline across the whole of eastern Canada. It was a road packed with lore and history. Today, Ontario Highway 2 exists only as a pitiful one-kilometre stub connecting the town of Gananoque to a bypass ramp. The rest of it fell under the knife of the Harris government and its fallacious fiscal policy of "downloading" provincial responsibilities to local governments less suited to handle them. So it came to pass, and the old course of 2 now exists as a patchwork of inadequately-signed and indifferently-maintained county roads and city streets. But wait! 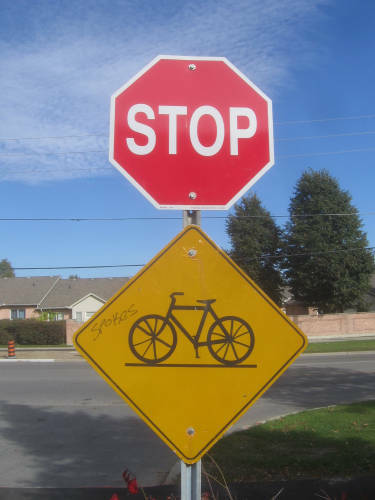 What about the sign above? Well, it turns out the province didn't quite eviscerate every trace of Highway 2 from southern Ontario. This one still clings to life, somewhat worse for wear, 20 years after it last had bearing! 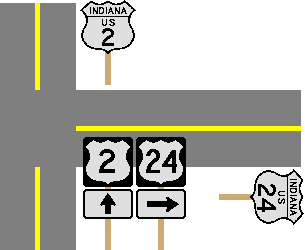 But the U.S. isn't Canada, and the MUTCD has no bearing north of the border. Consequently, Ontario's route markers are essentially the same now as they were 60 years ago...and they continue, unintentionally, to provide a glimpse into America's past! Remember what I said about going to Toronto a few weeks ago? I wasn't there for idle reasons. 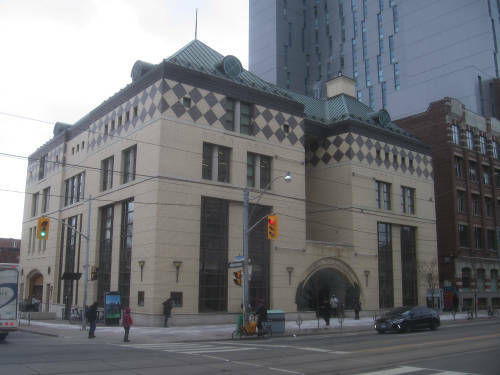 I am an MLIS student (in case you didn't already know), and in March my Children's Literature class made tracks for YYZ to view the Osborne Collection of Early Children's Books at the Lillian H. Smith branch of the Toronto Public Library. The Osborne Collection contains some extremely old books. 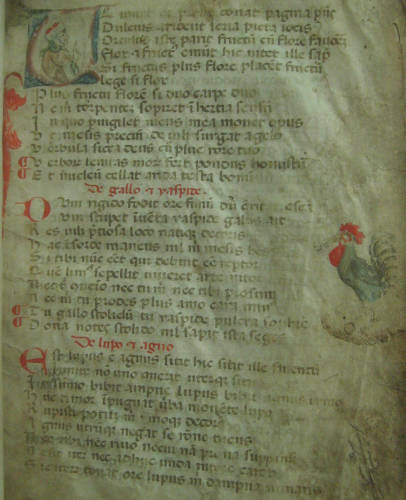 Among the crown jewels of the collection are an instructional hornbook from the 18th century, and the oldest book of them all: A Latin copy of Aesopus moralisatus (Aesop's Morals) inscribed on vellum and dating to the 14th century. (Yes, it's 700 years old.) I think of the distant past as being a dystopic era where young people were denied childhoods and ushered into "adult" responsibilities, abusive labour conditions, etc. at a premature age...but it's heartening to see that children's books existed in some form or another even in the bleak times of yesteryear. 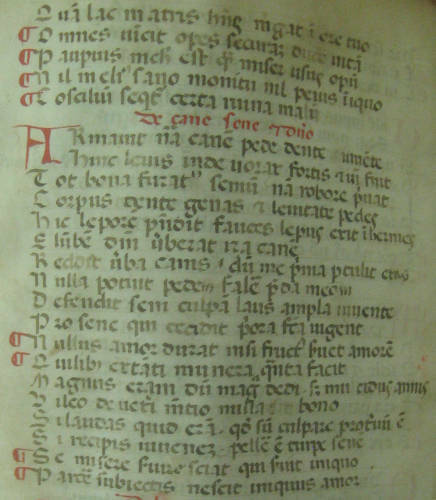 The 14th-century book makes judicious use of litterae notabiliores (notable or enlarged letters) and pilcrow symbols (¶). The pilcrow (or paragraph symbol, or Latin alinea) just might be my favourite typographical symbol: It's familiar, yet mysterious. It's distinctive. And, it used to have much greater significance than it does now. 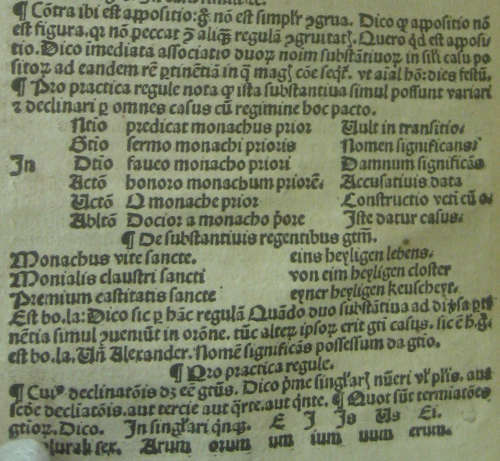 On manuscripts of the late middle ages, ¶ was used to indicate new trains of thought in much the same way that paragraph breaks or indents are used today. It also had a squat profile in those days (resembling a C more than a P), and was often inked in bright colours to provide contrast with the surrounding text. ¶ This is the case for Aesopus moralisatus: The left margin of each page is punctuated by squat red pilcrows galore. Due to the consistent and regular structure of the fables, the quantity and positioning of these symbols seldom varies: Two pilcrows appear in line with the last two lines of each tale; at the point where the moral appears, no doubt. ¶ With one exception, that is. On one anomalous page of the volume, two fables appear inscribed with four pilcrows apiece. What could be the significance of this? If I could read Latin, I'd know. ¶ Pilcrows also appear in the second-oldest book in the Osborne collection; a work titled Compendium octo partiu oronum set in Latin blackletter and printed in 1505. 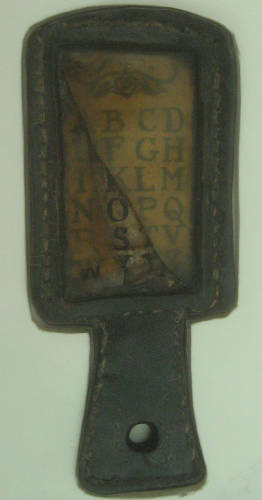 By this point the symbol was typeset and had gained an elongated stem, largely taking on its present-day appearance. By 1505, however, pilcrows were on their way out of books. According to Keith Houston (author of the book Shady Characters), the symbol became obsolete due to a confluence of circumstances following the advent of printing presses in the 15th century. Typefounders were reluctant to cast pilcrows in type because doing so stepped on the turf of the rubricator, whose profession consisted of adding pilcrows to books by hand. Rubricators were unable to keep up with the vast quantity of books that printing presses produced. Readers then got used to books with blank indents where the pilcrows were supposed to be...and the indents were just as useful as indicators as the symbols themselves had been. So endeth the tale of ¶, banished from the body of texts and relegated to specialized roles in legal citations and proofreading for centuries to come. Banished until 1991, that is, when Microsoft Word 2 for Windows appeared with the incriminating symbol on its toolbar. Clicking the ¶ button restores the very symbols to documents that the printing presses had banished 450 years earlier. So there you go! Units of play-reading; or, the amazing disappearing ¶. On pilcrows appearing in sixteenth-century playbooks; by Claire M. L. Bourne. The Pilcrow. A three-part account of the symbol's evolution, rise, and fall; also by Keith Houston. Pointing out Pilcrows. By J.K. Petersen, author of the Voynich Portal. I have a habit of looking down as I walk. Yes, I know there's nothing remarkable about that...watch your step and look where you're going is a lesson most of us have committed to memory since we were two...but sometimes there is something remarkable about the things you see down there. 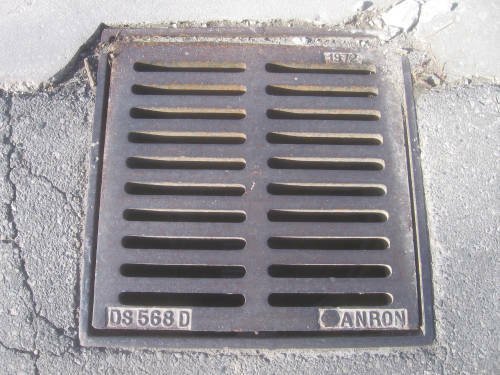 Take iron storm sewer grates: They have variations, they're typically emblazoned with the year in which they were cast, and they provide clues as to when their vicinity was developed. This grate is dated 1972, and it's also located in front of the building I happen to live in: The entire block was probably a cow pasture until then. Toronto has some surprisingly-old grates underfoot. This one is located near the corner of Huron and Cecil streets (roughly in between U of T and Chinatown), and hails from 1889. 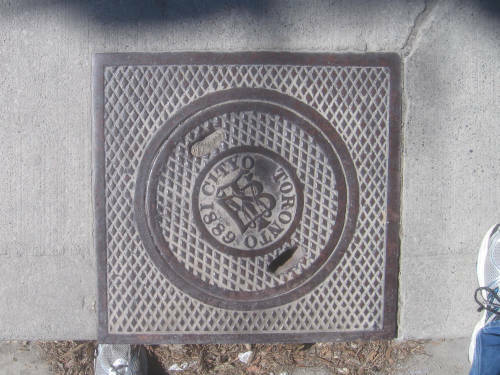 The ornate "TBW" monogram was the symbol of the Toronto Board of Works, the ancestor of what's known as Works and Emergency Services today. Also worth noting is that the letter "F" is missing from the lettering...which must have been a flaw in the mold. 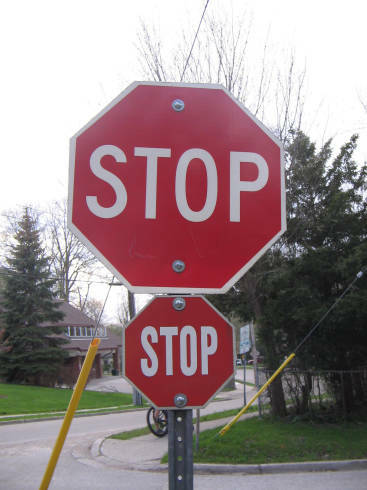 I'm also apparently not the only person who pays attention to these.